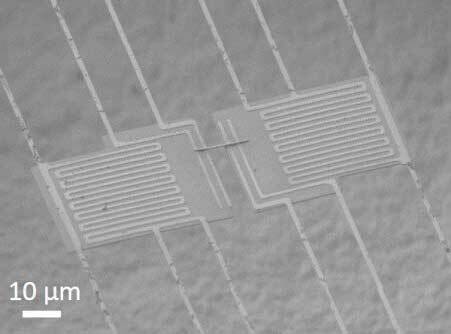 (Nanowerk News) A newly discovered collective rattling effect in a type of crystalline semiconductor blocks most heat transfer while preserving high electrical conductivity – a rare pairing that scientists say could reduce heat buildup in electronic devices and turbine engines, among other possible applications. A team led by scientists at the Department of Energy’s Lawrence Berkeley National Laboratory (Berkeley Lab) discovered these exotic traits in a class of materials known as halide perovskites, which are also considered promising candidates for next-generation solar panels, nanoscale lasers, electronic cooling, and electronic displays. These interrelated thermal and electrical (or “thermoelectric”) properties were found in nanoscale wires of cesium tin iodide (CsSnI3). The material was observed to have one of the lowest levels of heat conductivity among materials with a continuous crystalline structure. This so-called single-crystal material can also be more easily produced in large quantities than typical thermoelectric materials, such as silicon-germanium, researchers said. 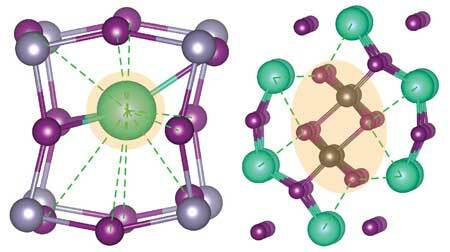 “Its properties originate from the crystal structure itself. It’s an atomic sort of phenomenon,” said Woochul Lee, a postdoctoral researcher at Berkeley Lab who was the lead author of the study, published the week of July 31 in the Proceedings of the National Academy of Sciences journal ("Ultralow thermal conductivity in all-inorganic halide perovskites"). These are the first published results relating to the thermoelectric performance of this single crystal material. Researchers earlier thought that the material’s thermal properties were the product of “caged” atoms rattling around within the material’s crystalline structure, as had been observed in some other materials. Such rattling can serve to disrupt heat transfer in a material. “We initially thought it was atoms of cesium, a heavy element, moving around in the material,” said Peidong Yang, a senior faculty scientist at Berkeley Lab’s Materials Sciences Division who led the study. Jeffrey Grossman, a researcher at the Massachusetts Institute of Technology, then performed some theory work and computerized simulations that helped to explain what the team had observed. Researchers also used Berkeley Lab’s Molecular Foundry, which specializes in nanoscale research, in the study. “We believe there is essentially a rattling mechanism, not just with the cesium. It’s the overall structure that’s rattling; it’s a collective rattling,” Yang said. “The rattling mechanism is associated with the crystal structure itself,” and is not the product of a collection of tiny crystal cages. “It is group atomic motion,” he added. Within the material’s crystal structure, the distance between atoms is shrinking and growing in a collective way that prevents heat from easily flowing through. But because the material is composed of an orderly, single-crystal structure, electrical current can still flow through it despite this collective rattling. Picture its electrical conductivity is like a submarine traveling smoothly in calm underwater currents, while its thermal conductivity is like a sailboat tossed about in heavy seas at the surface. Yang said two major applications for thermoelectric materials are in cooling, and in converting heat into electrical current. For this particular cesium tin iodide material, cooling applications such as a coating to help cool electronic camera sensors may be easier to achieve than heat-to-electrical conversion, he said. Cesium tin iodide was first discovered as a semiconductor material decades ago, and only in recent years has it been rediscovered for its other unique traits, Yang said. “It turns out to be an amazing gold mine of physical properties,” he noted. They also performed scanning electron microscopy to precisely measure the dimensions of the nanowire. They used these dimensions to provide an exacting measure of the material’s thermal conductivity. The team repeated the experiment with several different nanowire materials and multiple nanowire samples to compare thermoelectric properties and verify the thermal conductivity measurements. Also, just as computer chip manufacturers implant a succession of elements into silicon wafers to improve their electronic properties – a process known as “doping” – scientists hope to use similar techniques to more fully exploit the thermoelectric traits of this semiconductor material. This is relatively unexplored territory for this class of materials, Yang said.